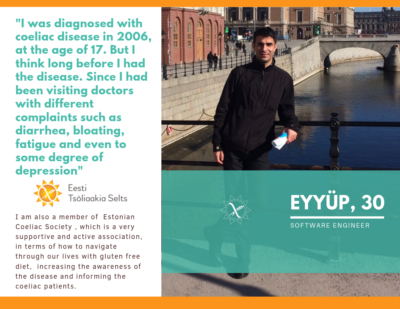 I was diagnosed with coeliac disease in 2006, at the age of 17. But I think long before I had the disease. Since I had been visiting doctors with different complaints such as diarrhea, bloating, fatigue and even to some degree of depression but many times I had been diagnosed with diarrhea or rather simple illnesses. After all that period, I was lucky enough to have a very good doctor, who is a professor in Vienna and well aware of the coeliac symptoms, prescribed me some tests to run and then I got diagnosed with celiac. At the first stage, it took me a while to get used to gluten free diet because back then both I was not so well aware of how coeliac affects my life and there weren’t so many variety of products. So I sometimes compromised my diet without being discreet enough. Today, I can rather easily reach gluten free products, specially after starting to live in Tallinn. Even though sometimes I look for different options, today, it is much easier to find gluten free products than couple of years ago. I can easily tell that coeliac diagnosis has substantially changed my life in many ways. First of all, I became very well aware of that I have to strictly adhere to gluten free diet and must not have even smallest particuls of gluten contaminated foods. Even if I eat something with gluten accidentally, that ruins my couple of days with extreme fatigue, bloating and cramps in stomach and takes sometimes to recover. Therefore, I am maintaining a strict gluten free diet. When I go outside, I only eat at places where I really trust that their meals don’t include gluten. 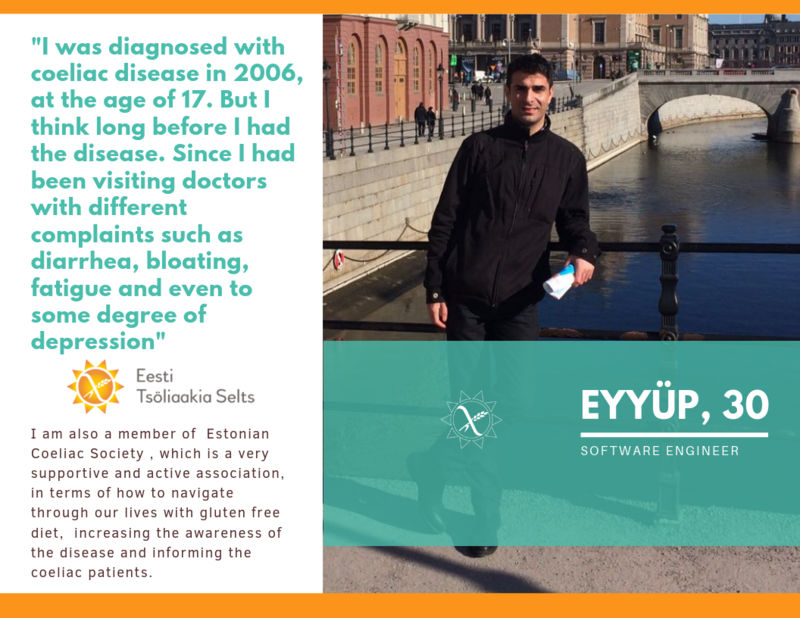 Besides all my self-effort to maintain my diet, I am also a member of Estonian Coeliac Society , which is a very supportive and active association, in terms of how to navigate through our lives with gluten free diet, increasing the awareness of the disease and informing the coeliac patients. Apart from that, so far I have attended Christmas parties, Summer Camp and General Meetings organized by the society, which I really enjoyed and felt very supported and like a family member among the other society members. Olen pärit Türgist ning mul diagnoositi tsöliaakia 2006. aastal, kui olin 17. Aga ma arvan, et haigus oli mul olnud juba palju aastaid enne seda, kuna ma olin pöördunud arstide poole erinevate kaebustega nagu kõhulahtisus, kõhupuhitus, väsimus ja isegi teatud määral depressiooniga. Olin lõpuks õnnelik, kui sattusin väga hea arsti juurde Viinis, kuna see arst oli teadlik tsöliaakia sümptomitest, tegi mulle vajalikud uuringud ning ma sain tsöliaakia diagnoosi. Alguses võttis dieediga harjumine aega. Ma ei teadnud, kuidas tsöliaakia mõjutab mu elu ning gluteenivabu tooteid polnud palju saada. Seega mõnikord tuli ette „patustamist“. Praegu ma suudan üsna kergesti jõuda gluteenivabade toodeteni, eriti pärast seda kui asusin elama Tallinnasse. Lisaks on praegu võimalused gluteenivabade toodete leidmiseks palju suuremad kui veel paar aastat tagasi. Võin öelda, et tsöliaakia diagnoos on oluliselt muutnud minu elu. Järgin gluteenivaba dieeti ning tean hästi ristsaastumise ohtusid. Isegi, kui mu toitu satub kogematagi veidi gluteeni, olen paar päeva väsinud, esinevad kõhupuhitus ja kõhukrambid. Seetõttu pean alati väga ranget gluteenivaba dieeti. Kui ma välja sööma lähen, söön ainult kohtades, mida ma tõesti usaldan, et nende söök ei sisalda gluteeni. Olen Tsöliaakia Seltsi liige, sest see on väga toetav ja aktiivne ühendus. Selts aitab tõsta tsöliaakiaalast teadlikkust ning informeerida patsiente gluteenivabast dieedist. Osalen seltsi suvelaagrites, jõulupidudel ning üldkoosolekutel. Naudin neid üritusi väga, sest tunnen, et olen nagu pereliige teiste seltsi liikmete seas.